High performance low-voltage transformers optimized to deliver verified savings with up to 80% less losses than pre2007/TP-1 transformers* and performance optimized specifically for ESCO, Utility and Commercial Energy Retrofit Applications. E-SAVER OPAL-R™ series transformers are ultra-efficient dry-type transformers that have been optimized for retrofits applications to deliver up to 80%+ less losses on pre-2007/TP-1 transformer replacements. OPAL-R models, 80R and 81R, maximize verified energy savings, supporting ESCO, Utility and Commercial Energy Performance Contracts by providing new infrastructure with the fastest payback in the most widespread retrofit applications. For transformers feeding dedicated equipment like fans, motors and elevators, or heavy harmonic-rich loads, see the E-Saver OPAL™ Series and T1000 OPAL™ Series transformers. Powersmiths also offers transformers with integrated breakers, for product details see the Energy Station TX™ product information. There is more to a transformer retrofit than simply matching the capacity and input/output voltages with a typical transformer from the distributor’s warehouse. 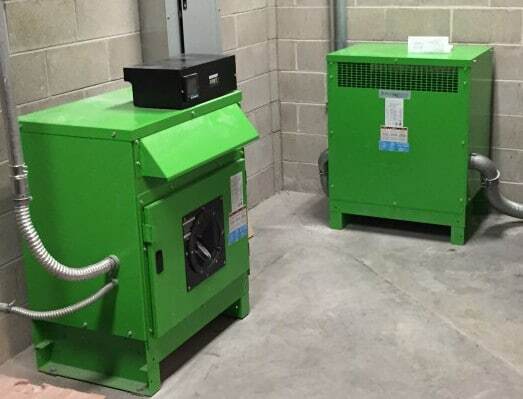 Retrofit applications must also consider site conditions like footprint, internal terminal layout and a transformer’s electrical characteristics that affect fault levels, arc flash risks and inrush currents – which have much more impact on an electrical system than just efficiency. To address these needs, Powersmiths has developed a transformer design best practice called OPAL™ – Optimized Performance for the Application Load. Our flexible design and manufacturing process enables us to deliver solutions for a wide variety of site conditions and transformer manufacturers including footprint and internal terminal layout compatibility. The OPAL-R™ series uses the OPAL™ design best practice to address the unique requirements of a retrofit combined with Powersmiths’ Retrofit Best Practice. The Retrofit Best Practice ensures energy performance contractors receive verified savings validated by certified meters and Powersmiths’ professional M&V services. Powersmiths enables right-sizing of electrical infrastructure by offering a much broader selection of transformer kVA sizes. The capital cost, operating cost and footprint reductions can be dramatic – on the order of 30-50%, through smaller transformers, breakers, conductors, and distribution panels. Powersmiths guarantees that every transformer we manufacture meets our published technical data, and furthermore, that this performance is met over the full term of the 32-year pro-rated warranty. Being able to trust that savings are both real and long-term is part of why organizations choose Powersmiths. Many general purpose transformers are purchased and installed because they have the lowest first cost, however, they carry a UL label on the basis of feeding only linear loads. Since most connected loads today are electronic with nonlinear profiles, a low-voltage transformer needs to be K-rated in order to have a valid UL listing for most applications today. E-Savers are appropriately K-rated. By going meaningfully beyond the DOE 2016 baseline efficiency, the E-Saver™ contributes to green building, LEED®, Net Zero and carbon footprint reduction goals. Additional benefits include our ISO14001 certified manufacturing, integrated metering and ability to integrate with the Powersmiths WOW™ Sustainability Management Platform. Powersmiths certifications include ISO 9001 (Quality), ISO 14001 (Environment), ISO 17025 (Efficiency Test Lab), UL and CSA. Powersmiths has a production integrated nonlinear load test program that enables efficiency verification under real-world conditions, as well as IPMVP compliant field measurement of losses and efficiency, and Certified Test Lab Load Profile test reports. Integrated metering can provide information about capacity utilization, load profiles, power quality and energy use. The lockable hinged door and our patented 360º Rotatable IR Port™ options, both provide quicker maintenance access and reduce arc flash safety risks.